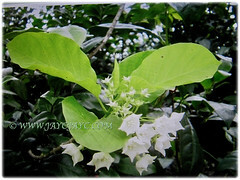 Botanical Name: Vallaris glabra (syn. : Vallaris pergulana). Common Names: Bread Flower, Kerak Nasi and Bunga Kesidang in Malay. Etymology: The genus name Vallaris is Latin for a garland given to the first soldier to climb over the enemy’s rampant. The specific epithet glabra is Latin for smooth, referring to the smooth leaves. 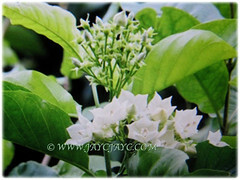 Plant type: A perennial and evergreen woody climber. Features: Vallaris glabra is from the genus, Vallaris that consists 3 accepted species. 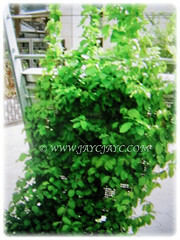 A moderate-growing climber that can reach between 2-3 m tall. Leaves are light green, glossy, elliptic or ovate with wavy leaf margin. Leaf apex is acute or has a distinct drip tip. They are arranged opposite along the branches. Stems is thin and woody stem, and has light grey and smooth bark. 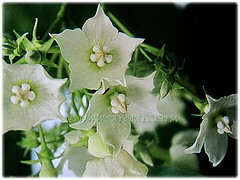 Its bisexual flowers are large, white and cup-shaped. They have 5 pointed, slightly overlapping petals. The outer edge of each petal is curled inward to form a sharp point in the middle. Flowers occur in dense terminal clusters near the branch tips. 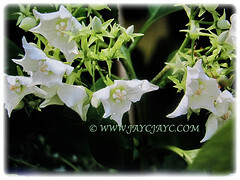 They open in the morning but their Pandan or burnt rice-like fragrance is strongest in the evening. Its simple and oblong beaked fruits splits into 2 dry, dehiscent fruits known as follicles. Culture (Care): Vallaris glabra or Bread Flower grows easily with the least maintenance. Light: Best in full sun but tolerate semi-shade. Moisture: Medium water requirement. Mulch the plants with compost to prevent the soil from drying out or the roots from overheating. 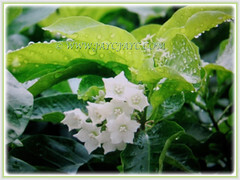 Others: Feed plants with a fertilizer rich in phosphorous to promote flowering. Avoid using nitrogen rich fertilizers, because they encourage development of leaves rather than flowers. Try not to prune this species frequently, because flowers are produced from the new growth. Generally free from serious garden pests and diseases. For subtropical and temperate regions: Hardiness: Not available. Propagation: Easily propagated stem cuttings, grafting and air-layering. 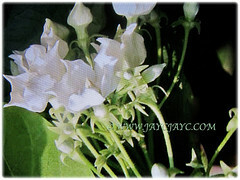 Usage: Vallaris glabra or Bread Flower is used as cut or dried flower. In the past, Malay women would tie their hair in a bun and place the flowers in the bun.It is often used in a special potpourri called “bunga rampai” for Malay weddings.This species is popular for landscaping in Thailand and other countries in Southeast Asia. It can be trained to drape over a trellis or pergola. Alternatively, you can prune it into a bush. This species will grow well in a large container and is suitable for a sunny patio. It will attract butterflies as a nectar plant for butterfly gardens. 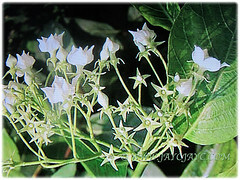 Its ornamental and white flowers and its intense evening fragrance would make it suitable for a Butterfly Garden. It is also a butterfly food plant. Its flowers are attractive to bees, butterflies and birds.